Almost everyday, without fail it seems, we receive at least one order for one of the incredibly popular Ray-Ban Wayfarer frames, usually the Ray-Ban RB5121 (for prescription glasses) or the Ray-Ban RB2140 (for Sunglasses). This classic design has been around for almost 60 years since its design and manufacture in 1952 yet has remained popular for much of its production period. So why are the most enduring fashion icons of the 20th century proving to be so popular? The Original Wayfarer style was designed in 1952 by optical designer Raymond Stegeman, who procured dozens of patents for Bausch and Lomb, Ray-Ban’s parent company. Like Ray-Ban Aviators, the Wayfarer was originally designed and marketed as sunglasses for pilots. 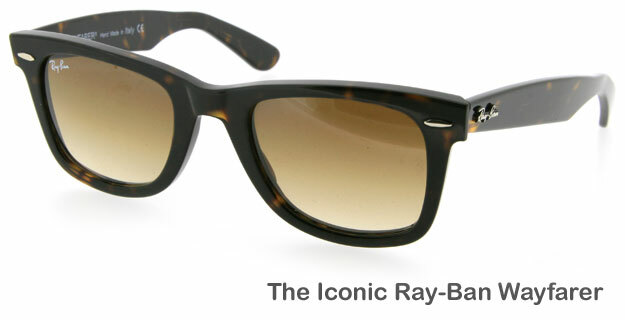 Although the Wayfarer was originally targeted at men, the style eventually became so popular that Hollywood women such as Marilyn Monroe and Audrey Hepburn (as worn in the 1961 movie Breakfast at Tiffany’s) began wearing them boosting their popularity. 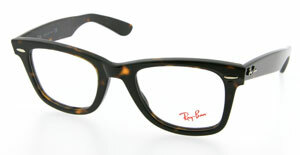 Popularity of the Wayfarer style faded in the 1970’s and were almost discontinued in the 1980’s before Ray-Ban signed a US$50,000-a-year deal in 1982 with Unique Product Placement of Burbank, California, to place Ray-Bans in movies and television shows. Since signing the product placement deal the Wayfarer style appeared in over 60 movies and television programs between 1983 and 1987 with the film Risky Business starring Tom Cruise kick starting the Wayfarer wearing phenomenon (360,000 pairs were sold that year!). The Wayfarer also rose to popularity in the music industry with musicians including Debbie Harry, Morrissey and members of U2 sporting them. Those of you with an interest in cheesy 80’s pop music will also recall a mention of the Wayfarer in the lyrics of the 1984 hit song “Boys of Summer” by Don Henley – “You got that hair slicked back and those Wayfarers on, baby…“. The Wayfarer style since declined in the 1990’s but received a redesign in 2001 (lighter, less angular and lighter injected plastic), and it wasn’t until the mid-2000’s that the Wayfarer sunglasses came back into fashion when many celebrities began to adopt the style. Celebrities – The key to the Wayfarer Success? Such is the popularity of Ray-Ban’s Wayfarer design, other designer names are adopting the Wayfarer style to cash in on the iconic design. We have had a quick browse through the wide range of glasses on our website and found these great alternative frames to the RB2140 and RB5121. These frames are available in both 47mm (small) and 50mm (large) lens width sizes. When placing an order, please specify which frame size you would prefer. If you have any thoughts about the success of the Wayfarer, why not leave a comment. I feel that these sunglasses are an icon of American Pop Culture. 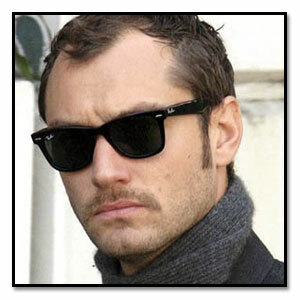 Its amazing how many fake Wayfarers there are out there. No one can match the lens of an authentic RayBan. I have worn Wayfarers for over ten years now. Not as a style statement (although they are stylish)but because they work. Flat lenses no distortion comfortable to wear, what more do you need. Some years ago a colleague of mine comented on my outmoded style “should have gone to Specsavers”, last year a French girl comment on my Chic glasses plus ca change…. Go for what works for you, they will come back in style. 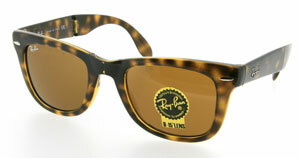 My name is Leonardo, i`m from Brazil, I`m looking for a specific Polo Ralph Lauren sunglass. I lost mine las week anda i cannot find it in any store here in Brazil. Can you help me? It`s similar to te model PH4030, but is a little bit smaler. The regular price was 150 dolars when i bought it.